Identification: Machado-Allison (1982) revised the pacus and provided distinguishing characteristics for Piaractus brachypomus. 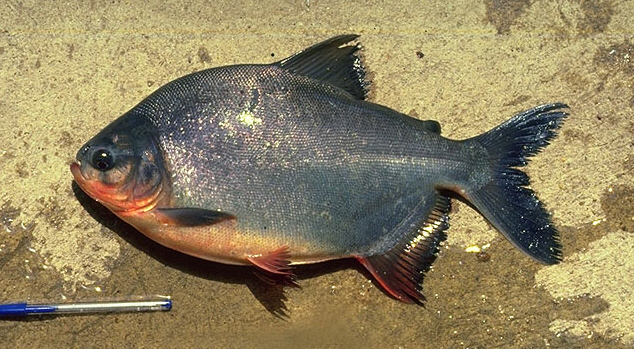 Many Piaractus taken in U.S. waters have been misidentified and reported as the red piranha Pygocentrus nattereri or as other common pacu species: tambaqui Colossoma macropomum or small-scaled pacu P. mesopotamicus. Species descriptions provided by Britski (1977) and Machado-Allison (1982). For photographs, see Machado-Allison (1982), Géry (1977, identified as Colossoma sp. on pages 252 and 256) and Goulding (1980, identified as C. bidens). Size: 85 cm SL and 20 kg. Native Range: Tropical America. Orinoco and Amazon river basins, South America (Machado-Allison 1982). Table 1. States with nonindigenous occurrences, the earliest and latest observations in each state, and the tally and names of HUCs with observations†. Names and dates are hyperlinked to their relevant specimen records. The list of references for all nonindigenous occurrences of Piaractus brachypomus are found here. Ecology: Red-bellied pacu are mainly vegetarian and frugivorous, consuming fruits and nuts from a variety of floodplain forest trees during the flood season and are major seed dispersers (Anderson et al. 2009). Red-bellied pacu undergo seasonal spawning migrations, moving from marginal lagoons and ponds at the beginning of flood season and migrating upstream to spawn in headwaters. Larvae are transported downstream to floodplain forests and savannas, consuming plankton (Machado-Allison 1992). Means of Introduction: Most records likely represent aquarium releases, although some Florida and Georgia records may have resulted from fish farm escapes. Status: Reported from 43 states; failed in all. Although some larger individuals have been captured, no instances of spawning or successful reproduction have been documented. Most reports are of single or few specimens. Remarks: This species is a popular aquarium fish and is sold in most pet stores as juveniles. In warmer climates such as south Florida, it is also a popular pond fish. It is a prized food fish in South America. Colossoma bidens and C. brachypomum are junior synonyms that have been widely used in the aquarium literature and in most past reports concerning fish introductions. To date, records maintained by the Georgia Department of Natural Resources on introduced foreign fishes show pacus identified as either Colossoma bidens (= Piaractus brachypomus) or as unidentified pacus. No C. macropomum have yet been taken in Georgia. A fish taken from the Snake River in Oregon (OS 13217) was originally identified as C. macropomum by Logan (1994), but one of us (LGN) examined this specimen and it more likely represents a hybrid between C. macropomum and Piaractus (also see Logan et al. 1996). All Texas specimens were taken by anglers and later identified by biologists of the Texas Parks and Wildlife Department. Selected voucher specimens: Alabama: (UF 98946); California (CAS 217067, 217648); Florida (UF 42782, 87879, 94136, 107100); Georgia (UF 98944); Illinois (SIUC 19835); Kentucky (SIUC 22241); Massachusetts (MCZ 96096); Mississippi (USM 14134, 14160, 14637); Montana (uncatalogued); North Carolina (NCSM 58972, 59640); Oregon (OS 11491); Texas (TNHC 11037). Voucher photographs: Arkansas, Florida, Illinois, Minnesota, Missouri, Montana, Nebraska, Texas (video film), and Virginia. Anderson, J.T., J. Saldaña Rojas, A.S. Flecker. 2009. High quality seed dispersal by fruit-eating fishes in Amazonian floodplain habitats. Oecologia 161:279-290. http://link.springer.com/article/10.1007/s00442-009-1371-4. Anonymous. 1988. Mighty Mississippi is full of secrets. Randolph County Herald Tribune. Chester, IL. 1988 (September 21). Anonymous. 1994. Water body records. Texas Parks & Wildlife News 1994(February 25):1-19. Anonymous. 2001a. Piranha caught at Lake Herman. KELOLAND TV. Sioux Falls, SD. http://www.keloland.com/newsdetail.cfm/piranha-caught-at-lake-herman-/?id=12795. Created on 08/14/2001. Accessed on 08/20/2013. Anonymous. 2001b. Lake Herman fish may not be piranha. KELOLAND TV. Sioux Falls, SD. http://www.keloland.com/newsdetail.cfm/lake-herman-fish-may-not-be-piranha/?id=12860. Created on 08/17/2001. Accessed on 08/20/2013. Anonymous. 2004a. Beware of unwanted exotic fish. Summit Daily News. St. Frisco, CO. August 24. http://www.summitdaily.com/apps/pbcs.dll/article?AID=/20040824/SPORTS/108240011. Created on 08/24/2004. Anonymous. 2004b. Pacu fishing records. http://www.hotspotfishing.com/records/fish-records-Pacu.asp. Accessed on 08/19/2004. Anonymous. 2005. Piranha caught in Missouri River. WOWT Channel 6. Omaha, NE. http://www.wowt.com/news/headlines/1649296.html. Created on 06/18/2005. Accessed on 08/20/2013. Anonymous. 2006a. A piranha in the UP? WLUC TV6. June 21. http://www.wluctv6.com/Global/story.asp?S=5062066&nav=81AX. Created on 06/21/2006. Anonymous. 2006b. Man catches pacu fish in Mississippi. KSDK-TV. July 28, 2006. http://www.ksdk.com/news/news_article.aspx?storyid=101082. Created on 07/28/2006. Accessed on 02/26/2010. Anonymous. 2006c. Fishy scare at Utah Lake was only piranha look-alike. Deseret News. Salt Lake City, UT. http://www.deseretnews.com/article/640194089/Fishy-scare-at-Utah-Lake-was-only-piranha-look-alike.html. Created on 07/12/2006. Accessed on 07/12/2006. Anonymous. 2008. Mixed Bag: Unusual catch. NebraskaLand Magazine. Nebraska Game and Parks Commission. Lincoln, NE. 2008 (December):11. Anonymous. 2009a. South American fish found in Otter Creek. Vermont Daily News. Burlington, VT. http://vermontdailynews.com/2009/10/south-american-fish-found-in-otter-creek/. Created on 10/23/2009. Accessed on 10/29/2009. Anonymous. 2009b. Toddler reels in piranha cousin from Northwest lake. KHQ Q6. Spokane, WA. http://www.khq.com/story/10972545/toddler-reels-in-piranha-cousin-from-northwest-lake. Created on 08/21/2009. Accessed on 08/22/2013. Anonymous. 2009c. Unique catch. The Cumberland Times-News. Cumberland, MD. http://times-news.com/archive/x46892059/Unique-catch. Created on 08/28/2009. Accessed on 08/22/2013. Anonymous. 2011a. Man catches piranha-like fish at Mountain Island Lake. WBTV. Charlotte, NC. http://www.wbtv.com/story/14890904/piranha-related-fish-caught-in-local-lake. Created on 06/12/2011. Accessed on 08/12/2013. Anonymous. 2011b. Fish similar to piranha found in Buckeye Lake. WBNS-10TV. Columbus, OH. http://www.10tv.com/content/stories/2011/08/11/buckeye-lake-pacu-pirahana-fishing.html. Created on 08/11/2011. Accessed on 08/19/2013. Anonymous. 2013. Piranha-like fish found in White River in Indianapolis. WTHR. Indianapolis, IN. http://www.wthr.com/story/23145529/2013/08/15/piranha-like-fish-found-in-white-river-in-indianapolis. Created on 08/15/2013. Accessed on 08/21/2013. Arnold, H. 2005. Just call him 'Pacu-Man'. The Daily Freeman. http://www.dailyfreeman.com/articles/2005/09/18/regional%20news/15232721.txt. Created on 09/18/2005. Accessed on 07/22/2013. Banek, T.J. - Fisheries Management Biologist, Missouri Department of Conservation, Springfield, MO. Barr, S. 2013. Hedingham family finds toothy fish in neighborhood lake. The News & Observer. Raleigh, NC. http://www.newsobserver.com/2013/07/31/3073557/hedingham-family-finds-toothy.html. Created on 07/31/2013. Accessed on 08/06/2013. Berghom, J. 2007. Piranha-like fish becoming more common in Valley. The Monitor. McAllen, TX. http://www.themonitor.com/news/local/article_65343fdd-0137-5b65-95ba-6f4278a935d3.html. Created on 06/12/2007. Accessed on 08/21/2013. Beym, J. 2011. Woodbury Heights 'fish tale' ends with mother-son pair pulling piranha from lake. Gloucester County Times. Woodbury, NJ. http://www.nj.com/gloucester-county/index.ssf/2011/06/woodbury_heights_fish_tale_end.html. Created on 06/22/2011. Accessed on 08/16/2013. Black, K. 2009. Piranha cousin caught in Marshalltown pond. The Times-Republican. Marshalltown, IA. http://www.timesrepublican.com/page/content.detail/id/518885.html. Created on 08/20/2009. Accessed on 08/14/2013. Bly, D. 2008. Hafen Pond yields strange intruder. Desert Valley Times. St. George, UT. September 23, 2008. http://www.thespectrum.com/apps/pbcs.dll/article?AID=/20080923/DVTONLINE01/80923003. Created on 09/23/2008. Accessed on 09/30/2008. Bohn, J. 1988. A toothy fish puts the bite on a Burke Lake angler. The Washington Post. Washington, DC. 1988 (June 4):G1, G3-4. Bonner, K. 2005. More than just a fish tale. The Daily Sentinel. Scottsboro, AL. http://thedailysentinel.com/story.lasso?ewcd=8889911139ca749e. Created on 10/07/2005. Accessed on 10/12/2005. Bostian, K. 2011. Piranha-like fish found at Keystone Lake. The Tulsa World. Tulsa, OK. http://www.tulsaworld.com/news/article.aspx?subjectid=11&articleid=20110928_11_0_Apairo223553. Created on 09/28/2011. Accessed on 10/18/2011. Bowman, D. 2009a. Lake Michigan pacu: a historical perspective. Chicago Sun-Times. Chicago, IL. http://blogs.suntimes.com/bowman/2009/08/lake_michigan_pacu_a_historica.html. Created on 08/17/2009. Accessed on 08/06/2013. Bowman, D. 2009b. Pacus: by three around Chicago. Chicago Sun-Times. Chicago, IL. http://voices.suntimes.com/sports/stray-casts/post-4-2/. Created on 09/14/2009. Accessed on 08/06/2013. Bowman, D. 2009c. Want a Washington Park pacu? Chicago Sun-Times. Chicago, IL. http://voices.suntimes.com/sports/stray-casts/want-a-washington-park-pacu/. Created on 06/05/2009. Accessed on 08/06/2013. Bowman, D. 2011. This week's field notes: another pacu. Chicago Sun-Times. Chicago, IL. http://www.suntimes.com/sports/outdoors/6763943-452/this-weeks-field-notes.html. Created on 07/30/2011. Accessed on 08/06/2013. Britski, H. 1977. Sobre o género Colossoma (Pisces-Characidae). Suplemento Ciencia y Cultura, Brasil, 29(7):810. Brooks, D. 2005. From the Amazon to Tate Pond. The Telegraph. Nashua, NH. http://www.nashuatelegraph.com. Created on 08/09/2005. Brown, S. 2007. Local angler reels in what appears to be pacu. Spartanburg Herald-Journal. Spartanburg, SC. http://www.goupstate.com/article/20070725/NEWS/707250345. Created on 07/25/2007. Accessed on 08/20/2013. Burr, B. - Southern Illinois University, Carbondale, IL. Carney, J. 2010. Deadliest catch? Not really. But girl gets bragging rights. Akron Beacon Journal. Akron, OH. http://www.ohio.com/news/deadliest-catch-not-really-but-girl-gets-bragging-rights-1.190016. Created on 08/03/2010. Accessed on 08/19/2013. Carter, L.A. 2000. Piranha kin found in creek, Casa Grande students worry about steelhead. The Press Democrat. Santa Rosa, CA. July 13:A1. Chinwah, L. 2005. Second piranha in 3 days caught in Wauconda lake. Daily Herald. Arlington Heights, IL. http://www.dailyherald.com. Created on 07/22/2005. Accessed on 07/25/2005. Clark, C. 2009. Piranha caught in Lake Winnebago? WLUK FOX 11. Green Bay, WI. http://www.fox11online.com/news/strange/local_wluk_fonddulac_piranha_caught_in_lake_winnebago_200909161700_rev2. Created on 09/16/2009. Accessed on 08/22/2013. Conley, J. 2005. Woman's haul at lake full of teeth. Roanoke Times. Roanoke, VA. http://ww2.roanoke.com/news/roanoke/29007.html. Created on 08/06/2005. Accessed on 08/08/2005. Cope, B. 2010. Pacu caught in Lexington County. http://www.southcarolinasportsman.com/lpca/index.php?section=reports&event=view&action=print&id=121524&sid=7a029fe22091b3ba38556e86ceda7019. Created on 07/08/2010. Accessed on 08/20/2013. Courtenay, W.R., Jr. - Florida Atlantic University, Boca Raton, FL. Cudmore-Vokey, B., and E.J. Crossman. 2000. Checklists of the fish fauna of the Laurentian Great Lakes and their connecting channels. Canadian Manuscript Report of Fisheries and Aquatic Sciences 2550. Fisheries and Oceans Canada, Burlington, Ontario. Davis, J. 2013. Exotic fish caught in lake near Marysville. The Everett Daily Herald. Everett, WA. http://www.heraldnet.com/article/20130805/NEWS01/708059865. Created on 08/05/2013. Accessed on 08/06/2013. Duggan, J. 2008. Former game warden catches illegally stocked Amazonian fish. Lincoln Journal Star. Lincoln, NE. http://journalstar.com/news/local/former-game-warden-catches-illegally-stocked-amazonian-fish/article_e2d76f1e-0b1a-5c83-9306-c8d9b39e6afb.html. Created on 07/20/2008. Accessed on 08/14/2013. Dyches, C. 2010. Fish with 'human-like' teeth found in Lake Wylie. WBTV. Charlotte, NC. http://southcarolina.wbtv.com/news/urban-wildlife/50962-fish-human-teeth-found-lake-wylie. Created on 09/13/2010. Accessed on 08/12/2013. Dyer, E. 2001. Piranhas are biting in the Ohio. Pittsburgh Post-Gazette. Pittsburgh, PA. http://old.post-gazette.com/sports/outdoors/20010908piranha0908p5.asp. Created on 09/08/2001. Accessed on 12/09/2005. Figura, D. 2010. Toothy, South American fish washes up dead on Oneida Lake's south shore. The Post-Standard. Syracuse, NY. http://blog.syracuse.com/outdoors/2010/10/toothy_south_american_fish_was.html. Created on 10/30/2010. Accessed on 07/24/2013. Frazier, M. 2007. Fisherman's toothy catch elicits visions of carnage. The Star-Telegram. Fort Worth, TX. http://www.star-telegram.com/news/story/196021.html. Created on 08/09/2007. Accessed on 08/10/2007. Fundingsland, K. 2006. South American freshwater fish caught at Patterson Lake. The Minot Daily News. Minot, ND. August 31, 2006. http://www.minotdailynews.com/News/articles.asp?articleID=5214. Created on 08/31/2006. Accessed on 08/31/2006. Gennings, R.M. - Georgia Department of Natural Resources, Atlanta, GA. Response to NBS-G nonindigenous questionnaire. Géry, J. 1977. Characoids of the world. Tropical Fish Hobbyist Publications, Inc., Neptune City, NJ. Goulding, M. 1980. Fishes of the forest: explorations in Amazonian natural history. University of California Press, Los Angeles, CA. Goulding, M., and M.L. Carvalho. 1982. Life history and management of the tambaqui (Colossoma macropomum, Characidae): an important Amazonian food fish. Revista Brasileira de Zoologia 1(2):107-133. Hartel, K. 1992. Non-native fishes known from Massachusetts freshwaters. Occasional Reports of the Museum of Comparative Zoology Fish Department 2:1-9. Holyoke, J. 2010. Limestone man charged with releasing exotic fish into Maine pond. Bangor Daily News. Bangor, ME. July 27, 2010. http://www.bangordailynews.com/story/Outdoors/Limestone-man-charged-with-releasing-exotic-fish-into-Maine-pond,149739. Created on 07/27/2010. Accessed on 08/02/2010. Howells, R.G., R.L. Benefield, and J.M. Mambretti. 1991. Records of pacus (Colossoma spp.) and piranhas (Serrasalmus spp.) in Texas. Management Data Series No. 70. Texas Parks and Wildlife Department, Fisheries Division, Austin, TX. Hutchinson, J. 2007. Fish found in Stafford Forge could be piranha or a plant-eating relative. Asbury Park Press. Neptune, NJ. http://www.app.com/apps/pbcs.dll/article?AID=2007707210359. Created on 07/21/2007. Accessed on 07/23/2007. Jacobs, J. 2009. Not your ordinary keeper. Corsicana Daily Sun. Corsicana, TX. http://corsicanadailysun.com/local/x1896318357/Not-your-ordinary-keeper. Created on 08/06/2009. Accessed on 08/07/2009. Jacobson, E. 2007. Shetucket River angler hooks fish long way from its home. Norwich Bulletin. Norwich, CT. http://www.norwichbulletin.com/apps/pbcs.dll/article?AID=/20070801. Created on 08/01/2007. Accessed on 08/09/2007. Jones, A. 2004. Pacu no threat to coast. The Sun Herald. Biloxi, MS. August 15, 2004:B9. Kaplan, T. 2012. Fish with teeth found in Lake Lou Yaeger in Litchfield, Illinios. KSDK. http://www.ksdk.com/news/article/325986/3/Fish-with-teeth-found-in-Illinois-lak. Created on 06/27/2012. Accessed on 08/06/2013. Killin, J. 2005. Toothy invader causes piranha scare. Del Rio News-Herald. Del Rio, TX. http://www.delrionewsherald.com. Created on 08/17/2005. Accessed on 08/25/2005. KLTV web staff. 2012. Piranha sub-species caught in East Texas lake. KLTV. Tyler, TX. http://henderson.kltv.com/news/news/80784-piranha-sub-species-caught-east-texas-lake. Created on 03/15/2012. Accessed on 08/12/2013. Knight, S. 2005. Unusual catch. Tyler Morning Telegraph. Tyler, TX. http://www.tylerpaper.com/site/news.cfm?newsid=15093078&BRD=1994&PAG=461&d. Created on 08/24/2005. Accessed on 10/12/2005. Landers, A., Jr. 1991. Woman snares piranha in Lake Cumberland. Lexington Herald-Leader. Lexington, KY. September 29:D14. Lee, M.C. 1991. Angler hooks toothy catch. The Daily News, Jacksonville, NC, 18 October 1991:B1-2. Lehman, L. - Indiana Department of Natural Resources, Vallonia, IN. Loe, K. 2005. Invasive relocation. http://www.aquahobby.com/tales/e_invasive.php. Accessed on 02/10/2010. Logan, D.J. - National Marine Fisheries Service, Santa Rosa, CA. Logan, D.J. 1994. A checklist of the fishes of Benton County, Oregon. American Currents 1994(Summer):16-18. Logan, D.J., E.L. Bibles, and D.F. Markle. 1996. Recent collections of continental exotic aquarium fishes in Oregon and thermal tolerance of Misgurnus anguillicaudatus and Piaractus brachypomus. California Fish and Game 82(2):66-80. Lore, D.C. 2012. Piranha fished out of Staten Island's Brooks Pond. The Staten Island Advance. Staten Island, NY. http://www.silive.com/northshore/index.ssf/2012/09/piranha_fished_out_of_staten_i.html. Created on 09/12/2012. Accessed on 08/22/2013. Machado-Allison, A. 1982. Estudio sobre la subfamilia Serrasalminae (Teleostei, Characidae). Prte 1. Estudio comparado de los juveniles de las "cachamas" de Venezuela (generos Colossoma y Piaractus). Acta Biologica Venezuelica 11(3):1-101. Machado-Allison, A. 1992. Larval ecology of fish of the Orinoco Basin. Pages 45-59 in Hamlett, W.C, ed. Reproductive biology of South American vertebrates. Springer. New York, NY. Maryland Department of Natural Resources. 2004. Maryland weekly fishing report overview. http://www.dnr.state.md.us/fisheries/fishingreport/frarchives.asp. Created on 10/13/2004. Maryland Department of Natural Resources. 2005. Maryland weekly fishing report overview. http://www.dnr.state.md.us/fisheries/fishingreport/frarchives.asp. Created on 08/03/2005. Mawson, A. 2010. Birthday boy reels in unusual gift, a Pacu. The Morning Journal. Lorain, OH. http://www.morningjournal.com/articles/2010/08/17/news/mj3166754.txt. Created on 08/17/2010. Accessed on 09/26/2010. McCoy, J. 2010. Catch looks like piranha, but it's equally rare pacu. Portage Daily Register. Portage, WI. http://www.wiscnews.com/news/article_2224f440-8b18-11df-b5c9-001cc4c002e0.html. Created on 07/08/2010. Accessed on 08/06/2013. McMillin, Z. 2011. Crikey! Jenison couple finds piranha-like fish in Grand River. The Grand Rapids Press. Grand Rapids, MI. August 7. http://www.mlive.com/news/grand-rapids/index.ssf/2011/08/crikey_jenison_couple_finds_pi.html. Created on 08/07/2011. Accessed on 08/08/2011. Middleton, K. 1988. Man-eating fish found in river. Athens News Courier, 1 September 1988. 105(177):1-2. Milavsky, B. 2006. Something's fishy about local man's latest catch. The Express-Times. Easton, PA. July 31, 2006:A2. Milligan, D. 2009. Fishing for bream, catching a 16-pound pacu. The Ledger. Lakeland, FL. http://www.theledger.com/article/20091118/NEWS/911185075. Created on 11/18/2009. Accessed on 12/04/2009. Minnesota Department of Natural Resources. 2005. Field Notes: Don't Let Them Go. http://www.dnr.state.mn.us/volunteer/mayjun05/fninvasives.html. Created on 05/01/2005. Accessed on 12/20/2012. Moorhead, C. 2010. Funny-looking fish are no laughing matter. Houston County News. La Crosse, WI. http://lacrossetribune.com/houstonconews/news/local/funny-looking-fish-are-no-laughing-matter/article_ef2cf598-bb96-57f8-b587-6fbc9679fb73.html. Created on 09/08/2010. Accessed on 08/07/2013. Nearing, B. 2011. 'Vegetarian piranha' hooked in Hudson. The Times Union. Albany, NY. http://www.timesunion.com/local/article/Vegetarian-piranha-hooked-in-Hudson-1584936.php. Created on 07/25/2011. Accessed on 08/07/2013. Neavling, S. 2007. A fish story -- with teeth. Detroit Free Press. Detroit, MI. August 21, 2007. http://www.freep.com/apps/pbcs.dll/article?AID=/20070821/NEWS06/708210344/1001/NEWS. Created on 08/21/2007. Nellans, J.D. 2009. You won't believe this PV angler's catch. The Daily Courier. Prescott, AZ. http://www.dcourier.com/main.asp?Search=1&ArticleID=71605&SectionID=1&SubSectionID=1&S=1. Created on 08/21/2009. Accessed on 07/25/2013. Nicholson, K. 2008. Angler lands toothy catch in Lakewood. The Denver Post. Denver, CO. http://www.denverpost.com/news/ci_9699546. Created on 06/28/2008. Accessed on 08/16/2013. Niskanen, C. 2006. Lifelong St. Croix River angler reels in a big surprise. St. Paul Pioneer Press. St. Paul, MN. July 9:G7. Ohnesorge, S. 2013. Exotic fish caught in Lake Hickory, "tip of the problem" say wildlife officials. WBTV. Charlotte, NC. http://www.wbtv.com/story/22636819/exotic-fish-caught-in-lake-hickory-tip-of-the-problem-say-wildlife-officials. Created on 06/19/2013. Accessed on 08/12/2013. Pearson, L. - Austin, Texas. Piper, B. 2011. Red-bellied pacu caught in Lake St. Louis dies. KSDK-TV. St. Louis, MO. http://www.ksdk.com/news/article/271084/3/Red-bellied-pacu-caught-in-Lake-St-Louis. Created on 08/10/2011. Accessed on 08/15/2013. Rains, C. 2010. Meadowlake fisherman lands exotic catch. Enid News and Eagle. Enid, OK. http://enidnews.com/localnews/x180470045/Meadowlake-fisherman-lands-exotic-catch. Created on 09/29/2010. Accessed on 09/30/2010. Raymond, A. 2013. Winchester man catches fish in the piranha family. TV3 Winchester. Winchester, VA. http://www.tv3winchester.com/home/headlines/209285131.html. Created on 05/30/2013. Accessed on 08/21/2013. Reilly, P.J. 2009. South American pacu hooked in Conestoga. LancasterOnline. Lancaster, PA. http://lancasteronline.com/article/local/241644_South-American-pacu-hooked-in-Conestoga.html. Created on 09/01/2009. Accessed on 08/19/2013. Richie, K. 2004. Amazonian fish caught in Caney Lake. Minden Press-Herald. April 28, 2004. Rocco, D. 2013. Man catches rare fish in Delaware County lake. CBS 3. Philadelphia, PA. http://philadelphia.cbslocal.com/2013/07/17/man-makes-bizarre-catch-in-delaware-county-lake/. Created on 07/17/2013. Accessed on 08/19/2013. Rockenstein, D. 2008. Fish with teeth, crazy catch. Lake Country Record-Bee. Lakeport, CA. http://www.record-bee.com/ci_11026531. Created on 11/19/2008. Accessed on 11/20/2008. Roden, H. 2011. Spring man, fishing Lake Woodlands, may have caught South American pacu. The Conroe Courier. Conroe, TX. http://www.yourhoustonnews.com/courier/news/spring-man-fishing-lake-woodlands-may-have-caught-south-american/article_11d54231-b9d4-5e9a-b518-7e05e5830aa2.html. Created on 05/03/2011. Accessed on 08/21/2013. Roesler, R. 2003. Freed pets taking over. The Spokesman-Review. October 27, 2003. Rojas, S. 2012. Exotic catch no fish tale. San Angelo Standard-Times. San Angelo, TX. http://www.gosanangelo.com/news/2012/sep/14/fish-tale-could-be-a-misdemeanor/. Created on 09/14/2012. Accessed on 08/21/2013. Ross, S.T. - University of Southern Mississippi, Museum of Ichthyology. Ross, S.T., and W.M. Brenneman. 1991. Distribution of freshwater fishes in Mississippi. Freshwater Fisheries Report No. 108. D-J Project Completion Report F-69. Mississippi Department of Wildlife, Fisheries and Parks, Jackson, MS.
Ruiz-Carus, R., and S.B. Davis. 2003. Register of an exceptionally large redbellied pacu, Piaractus brachypomus (Teleostei, Characidae), in East-Central Florida, with gonad and diet analyses. Florida Scientist 66(3):184-188. Saunders, F. 2013. Man finds piranha relative in Maquoketa River. KCRG-TV9. Cedar Rapids, IA. http://www.kcrg.com/news/local/Man-Finds-Pi-211320741.html. Created on 06/12/2013. Accessed on 08/14/2013. Seeley, D. 2011. Local angler reels in rare fish from Schuylkill River. The Mercury. Pottstown, PA. http://www.pottsmerc.com/article/20110805/NEWS01/308059967/local-angler-reels-in-rare-fish-from-schuylkill-river. Created on 08/05/2011. Accessed on 08/07/2013. Simon, A. 2009. Unusual catch gives Easley family an exotic fish tale. The Greenville News. Greenville, SC. 2009. http://www.greenvilleonline.com/apps/pbcs.dll/article?AID=/20090405. Created on 04/05/2009. Accessed on 04/07/2009. Simon, J., and B. Breidert. 2003. All In a Day's Work: Lake Michigan Fisheries Research Station. AFS Indiana: Newsletter of the Indiana Chapter of the American Fisheries Society 12(3):22. http://www.indianaafs.org/pages/Newsletter. South Carolina Department of Natural Resources. 2006. Non-native Pacu fish caught in Sampit River. http://dnr.sc.gov/news/Yr2006/aug28/aug28_pacu.html. Created on 08/26/2006. Accessed on 08/20/2013. Stephens, T. 2005. S. American fish caught in Ohio River. The Herald-Dispatch. Huntington, WV. http://www.herald-dispatch.com/apps/pbcs.dll/article?AID=/20050915/NEWS02/509150347/1001/NEWS. Created on 09/15/2005. Suarez, D. 2006. Piranha relative caught in Yuma canal. Yuma Sun. Yuma, AZ. http://www.yumasun.com/articles/fish-22041-vanak-hovatter.html. Created on 07/06/2006. Accessed on 07/25/2013. Texas Parks and Wildlife Department. 2001. Fish Records: Water Body - All Tackle. http://www.tpwd.state.tx.us/fishboat/fish/action/staterecords.php?env=FW&age_group=all&list=0&browse=Submit. Created on 04/24/2001. Accessed on 06/15/2001. Thomson, C. 2006a. A piranha in Dundalk. The Baltimore Sun. http://articles.baltimoresun.com/2006-09-27/news/0609270066_1_piranha-fish-aquarium. Created on 09/27/2006. Accessed on 08/13/2013. Thomson, C. 2006b. Dundalk fish tale loses its bite. The Baltimore Sun. http://articles.baltimoresun.com/2006-09-30/sports/0609300107_1_piranha-dundalk-fish. Created on 09/30/2006. Accessed on 08/13/2013. The University of Georgia - Center for Invasive Species and Ecosystem Health. 2012. EDDMapS database. http://www.eddmaps.org/. Vidika, R. 2010. Fisherman snares pacu in Lake Erie. The Morning Journal. Lorain, OH. http://www.morningjournal.com/articles/2010/07/14/news/mj3025084.txt. Created on 07/14/2010. Accessed on 08/06/2013. Voth, S. 2012. Local woman hooks toothed fish, believed from South America. The Northern Virginia Daily. Strasburg, VA. http://www.nvdaily.com/news/2012/06/shenandoah-river-monster.php. Created on 06/01/2012. Accessed on 08/07/2013. Watling, M. 2009. Lafayette man catches piranha in Wabash. The Indianapolis Star. Indianapolis, IN. http://www.indystar.com/article/20090824/LOCAL/90824057. Created on 08/24/2009. Accessed on 09/09/2009. Weisberg, D. 2006. Local fisherman reels in a piranha. Pittsburgh Post-Gazette. Pittsburgh, PA. http://www.post-gazette.com/stories/sectionfront/life/local-fisherman-reels-in-a-piranha-444390/. Created on 08/01/2006. Accessed on 08/19/2013. Weisburg, D. 2007. Exotic problem for Penn Hills boy. Pittsburgh Post-Gazette. Pittsburgh, PA. http://www.post-gazette.com/stories/sports/hunting-fishing/exotic-problem-for-penn-hills-boy-490702/. Created on 06/24/2007. Accessed on 06/26/2007. Welsch, R.L. 1996. Something's fishy in the cornbelt: jaws. Natural History 105(8):66-67. Wright, S. 1995a. A fishy situation. Northwest Arkansas Times (Fayetteville), 7 June 1995, 129(350):A1. Wright, S. 1995b. Piranha or pacu? it's still a whale of a fish tale. Northwest Arkansas Times (Fayetteville), 7 June 1995, 129(350):B6.